Agnes Tilney is one of those women who wittingly or unwittingly had a considerable impact on events in Tudor history. She married into the rich and powerful Howard family and would have great influence at the court of King Henry VIII. Queen Anne Boleyn and Queen Catherine Howard were her step-granddaughters. The Howard’s were magnates who supported Kings Edward IV and Richard III during the Wars of the Roses. At the time they were the Earls of Surrey. Thomas Howard married first Elizabeth Tilney and together they had ten children, seven sons and three daughters. Their eldest son, also Thomas, was first married to Anne, the daughter of Edward IV. When she died, he married Elizabeth Stafford, the daughter of the Duke of Buckingham. Thomas’ sister Elizabeth married Thomas Boleyn whose daughter Anne would marry King Henry VIII. Other sons of the Earl of Surrey included Edward and Edmund who were promising knights. Edmund was the father of Catherine Howard, Henry VIII’s fifth wife. After the Battle of Bosworth, the fortunes of the Howard family declined but eventually they turned around with loyal service to King Henry VII. During the reign of King Henry VIII, Surrey was in command of the victorious army that met James IV, King of Scots at the Battle of Flodden on September 9, 1513. As a reward for this tremendous win, he was given the title of Duke of Norfolk. The newly named duke’s wife Elizabeth had died in the spring of 1497. Agnes Tilney was her cousin and it is believed she lived in the Howard household. 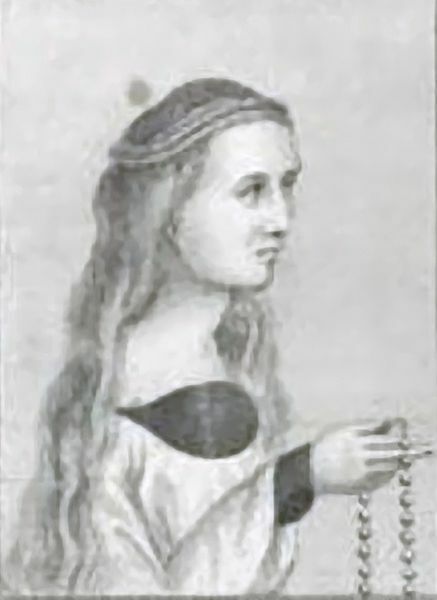 Agnes, born c. 1477, was the daughter of Hugh Tilney of Skirbeck and Boston in Lincolnshire. Her mother was the daughter of Walter Tailboys. Agnes brother worked in the household of the Earl of Surrey. There is some discrepancy regarding the year Norfolk married Agnes. Some records indicate they were married shortly after Elizabeth Howard died but there is an argument to be made that they were married in 1509. Judging by the dates when Agnes’ children were born, the later date seems likely. Agnes and Thomas had seven children together of which two sons and four daughters survived. In 1516, Agnes acted as godmother for the Princess Mary, daughter of Henry VIII and Katherine of Aragon. 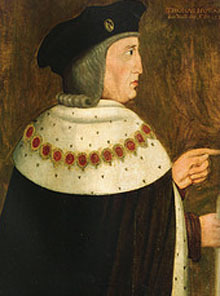 The second Duke of Norfolk died in 1524 at the age of eighty-one. He bequeathed to Agnes plate, jewels, household items such as bedding, hangings, sheets, fustians, blankets, pillows, cushions, hanged beds of gold, silk, items for the chapel and the kitchen, clothing, horses, harnesses, long-bows, cross bows, wine, gold, silver, all debts owed to him and revenues from his lands. The effect of this made Agnes a very rich widow and one of the highest ranked women in the land. She was now called the Dowager Duchess of Norfolk. Agnes would live in Chesworth House at Horsham in Sussex, and in the Howard suburban residence of Lambeth. She is described as testy, kind-hearted, short-tempered and old-fashioned. She lived a fanatically religious life and wore a hair shirt under her pious clothing. There is evidence that in 1528, she provided the king’s principal minister Cardinal Thomas Wolsey with recipes for medicine. She was the patron of the poet John Skelton who had served as tutor to King Henry VIII. According to the ordinances issued at Eltham for the reform of the royal household in 1526, Agnes was the first lady of the Queen’s household after the king’s sister Mary. Her high rank gave her some influence at court regarding the giving and receiving of favors from the king. Agnes did not approve of Henry’s efforts to end his marriage to Katherine of Aragon but she was the step-grandmother of Anne Boleyn, thereby retaining her high status at court. She participated in Anne’s coronation and carried the newborn Princess Elizabeth at her baptism and acted as the infant’s godmother. Agnes’ stepson Edmund, being the younger son of an aristocratic family, had a hard time earning a living. Together with his wife Joyce (Jocasta), they had ten children. Consequently, some of the children were placed in different aristocratic households which was a common practice at the time. Edmund’s daughter Catherine Howard came to live in Agnes’ home in 1536. Catherine was to receive discipline and training in good manners, a rudimentary formal education along with music and dancing lessons, and other accomplishments. She would sleep in a communal dormitory and was expected to perform light household duties, just as a servant would. Agnes had a busy and complex life running her vast household. Her home at Chesworth included five great rooms downstairs and five rooms and a garret upstairs. It also included the malt-house, the barn, the stable, the cow barn and four acres of orchards and gardens as well as several fish ponds. Her household may have consisted of one hundred people. The estate included a two hundred- and twenty-three-acre park with numerous deer. Some of the tasks Agnes was responsible for would have been splitting wood, carding of flax, weaving of cloth for clothes and collecting goose-down for bedding. Producing food for the household and the guests was a huge task. This included smoking hams, curing bacon, growing and preserving vegetables and fruit, brewing ale and baking bread. All of this took up the Duchess’ considerable attention. She had the help of her steward, secretary and her cellarer but the ultimate responsibility was hers alone. Henry Manox was hired by Agnes to teach Catherine and the other girls in the household the virginals and lute. Manox took advantage of Catherine during her music lessons. Eventually Manox left the household. Francis Dereham was working for Agnes and began an affair with Catherine, actually being admitted to the girl’s dormitory at night and sleeping with her. Agnes may have frowned on the antics of the youth under her care but she tolerated the behavior and most likely knew more than she let on. Agnes definitely knew Dereham took advantage of Catherine. She caught them kissing in the corridor for which they were both punished. Catherine was not the only young lady to entertain men at night and it is surprising that Agnes didn’t hear of it sooner. Her dalliance with Frances Dereham evoked jealousy from her prior love interest Henry Manox. Along with a friend, Manox wrote a letter to Agnes revealing the amorous nighttime adventures in the lady’s dormitory and left it in her pew in the chapel. Agnes castigated her servants for their negligence but she may not have recognized Catherine’s participation and didn’t take the warning all that seriously. Catherine had noticed the letter in the pew and afterwards stole it from the Agnes’ coffer and showed it to Dereham. The couple acted as though they would marry even though they didn’t have the permission of Agnes. In the autumn 1539, Thomas Howard, third Duke of Norfolk arranged for Catherine to take a position at court as one of the maids-in-waiting for Henry VIII’s new wife Anne of Cleves. Catherine was sent to further the interests of the Howard family and dutifully came to the notice of King Henry. The rest is history. Henry annulled his marriage to Anne of Cleves and married Catherine, his “rose without a thorn” July 28, 1540. Agnes released Dereham from her household and he went to Ireland to seek his fortune but later returned. He had always been a favorite of Agnes and she asked Queen Catherine to find a place for him in her court. In August of 1541, he was made private secretary and usher of the chamber. It was about this time Catherine embarked on an affair with her distant cousin Thomas Culpeper. During the summer of 1541, the king and queen went on progress. After their return to London in October, the council received the news of Catherine’s liaisons with Frances Dereham and Henry Manox. While those who opposed the influence of the Howard’s were pleased with the news, everyone agreed the situation was dangerous. The council asked Thomas Cranmer, Archbishop of Canterbury to break the news to the king. John Lassells reported to the archbishop that his married sister Mary Hall, who lived in Agnes’ household with Catherine, had revealed the details of the mischiefs in the women’s dormitory. The archbishop wrote these revelations down in a letter and presented it to the king during his devotions in the chapel at Hampton Court, urging him to read it in private. Henry, unexpectedly, was confused by the letter. He asked for an investigation and went on with life as usual for about a week. John Lassells, Mary Hall, Henry Manox and Frances Dereham were all interrogated. Manox and Dereham confessed to knowing the queen intimately and Mary Hall’s story was confirmed. The king was incredulous. He ordered Catherine to remain in her chambers to await his orders. Whether or not Catherine escaped her guard and ran down the gallery to the chapel to seek her husband, Henry would never see her again. He went to London after November 6 and met with his Privy Council in an emergency session. Later in the investigation, Catherine’s affair with Thomas Culpeper was revealed and Henry was devastated. Catherine was imprisoned and eventually executed on February 13, 1542. When Agnes was implicated, she opened Dereham’s coffers which were in her keeping and destroyed several documents, causing her to look guilty. She was intensely interrogated. There was a great fear all of her goods would be confiscated. At one point during the questioning, she fell on her knees weeping, asking God to save the king and give him a long and prosperous life. She also revealed where she had about £800 hidden in her chambers. Agnes was accused of presumptive treason. But these charges were downgraded to misprision because she failed to divulge the truth about Catherine’s past sexual activities and deliberately deceived the king when she assured him Catherine was pure and chaste. She was convicted and put in the Tower in January of 1542. It was believed that the strain of the indictment would be too much for her and the loss of her goods so devastating that she was pardoned in early May. “I, Agnes, Duchess of Suffolk, widdowe, of late the wife of the most noble Prince, Thomas Duke of Norfolk deceased, make my will XII days of Marche, 1542. My bodye to be buried within the parishe churche of Lambithe, County Surrey, in suche place whereas I have prepared my Tomb. To my Chapple of Lambith, my best chalice of silver and gilte with the patten. I will that my sonne Lord William Howarde have iij partes of all my goodes, both household stuffe, Juells, and Plate. I give to my Lady Bridgewater my daughter, the fourth part of all my goodds, and four parts of all my rayment (clothing). To Sir John Rabon, chauntry priste of Lambithe, a sliver spones. To my nephew, Tinlay (Tilney), a goblet of sliver and gilte without a cover. Executors of my will, my sonne Lord William Hawarde, and my nephew, Tynlay. Agnes died in 1545 at the age of sixty-eight and was buried initially in Thetford Abbey. On October 13, her remains were removed to Lambeth church in Surrey as her will had specified. By 1546, her stepson, Thomas Howard, third Duke of Norfolk had regained all of her jointure consisting of twenty-four manors in Suffolk, Surrey, Essex, Lincolnshire and Sussex.